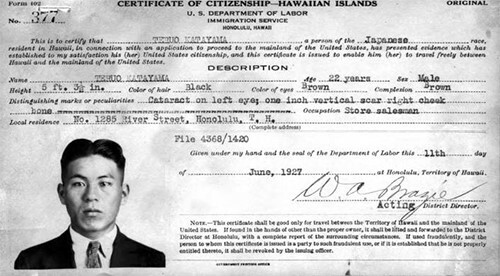 This exhibit of the CSU Japanese American Digitization Project (CSUJAD) presents a documentary narrative of Japanese nationals in America (Issei) and their American-born children (Nisei) before, during, and after World War II. The textual and photographic materials are selected from digitized documents residing in the CSUJAD Database (CSU Dominguez Hills) and the Japanese American Archival Collection ImageBase (Sacramento State). Through the generous support of the National Endowment for the Humanities and the National Park Service, Japanese American archives from fifteen CSU and UC campuses will continue to be added to the CSUJAD Database through 2018. Through photographs, correspondence, news digests, maps and more, this exhibit offers researchers, teachers, and students a glimpse into the unjust incarceration of approximately 120,000 Japanese Americans from 1942-1946. Navigating the exhibit: Users may follow a linear path through the exhibit by following links provided at the bottom of each page. Alternatively, users can hover over the upper leftmost icon to produce the navigable menu, "Table of Contents". Hovering over the compass icon will produce links to navigable and interactive visualizations such as "Contents" and "Connections". Posters: As part of the CSUJAD team's commitment, print-ready posters regarding the incarceration of Japanese Americans were originally created and distributed among project partners to display in local exhibit spaces. These posters are freely available to the public to be downloaded and used in relevant events as desired. Steve Kutay - exhibit design, installation, selection, "Introduction"
Greg Williams - exhibit selection, chapter introductions & "About CSUJAD"